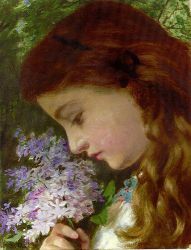 Sophie Gengembre Anderson (1823, Paris – 10 March 1903, Falmouth, Cornwall) was a French-born British artist who specialised in genre painting of children and women, typically in rural settings. 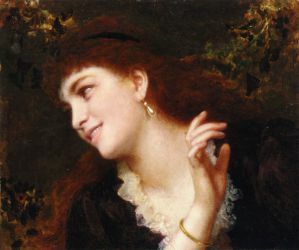 Her work is loosely associated with the Pre-Raphaelite movement. She was the daughter of Charles Gengembre, a Parisian architect, and his English wife. She was largely self-taught, but briefly studied portraiture with Charles de Steuben in Paris in 1843. The family left France for the United States to escape the 1848 revolution, They first lived in Cincinnati, Ohio, then in Manchester, Pennsylvania, where she met and married the British genre artist Walter Anderson. She initially worked in portraiture, including work for the chromolithographers Louis Prang & Co.. 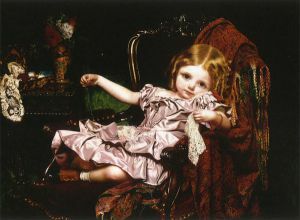 In 1854 the Andersons moved to London, where she exhibited her works in the Royal Academy. They returned to New York in 1858, then finally settled in London around 1863. Over the next three decades, her work was widely shown at venues including the Royal Academy, the Society of British Artists and many regional galleries. Her early works showed strong attention to botanical and other detail, in common with the Pre-Raphaelites. A world record price for her work of more than £1 million was achieved by No Walk Today at Sotheby's in London in November 2008. She died at home in Falmouth in 1903.